Volkswagen's crossover family is substantially changed for 2018 with a redesigned Tiguan and an all-new Atlas. The brand's new top crossover vehicle, the 2018 Volkswagen Atlas features a spacious three-row passenger compartment able to accommodate up to seven passengers. The 2018 Atlas is available with a 235-horsepower turbocharged 2.0-liter four-cylinder engine or a 3.6-liter V-6 that produces 276 horsepower. Gaining 10.6 inches in total length, the new Volkswagen Tiguan comes in four trim level boasting impressive standard features and available third-row seating. On 2018 models of the Beetle and Passat, a turbocharged 2.0-liter four-cylinder engine replaces a 1.8-liter powerplant with improved horsepower. Along with the new base engine, the 2018 Volkswagen Beetle is offered with a new Coast special edition model styled with seaside accents such as a surfboard wood-look dashpad. The 2018 Volkswagen Golf hatchback and wagon feature a redesigned front end that includes LED daytime running lights. A 6.5-inch touchscreen infotainment is added to the Golf's S trim level while SE models and above is given a larger 8-inch touchscreen. The Volkswagen CC and Touareg have been retired for 2017 with the latter model being effectively replaced by the Atlas and the 2019 Arteon will takeover for the former four-door coupe. 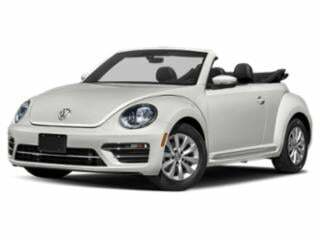 The Beetle convertible delivers the same features and technology you love about the standard version, but with a retractable top.